June 17th is just around the corner! Still looking for Father’s Day Deals? We got you covered! 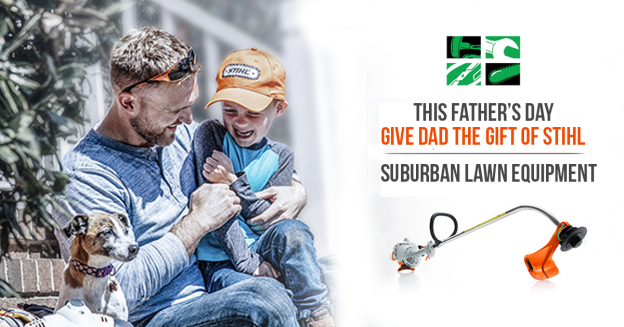 Come in to Suburban Lawn Equipment to shop first class outdoor power equipment from STIHL – the #1 selling brand of gasoline-powered handheld outdoor power equipment in America. Convenience, efficiency and value for your investments guaranteed! When it comes to providing top cleaning performance, STIHL delivers pressure washers combining power and high-quality components. Whether you need to clean your deck or your professional equipment, STIHL power washers are designed for convenience and durability to make your job easier and impeccable. STIHL delivers lawn care innovation once again with the addition of battery-powered lawn mowers. But these aren’t your typical walk-behind mowers. These revolutionary mowers are built with Lithium-Ion battery technology, making them lightweight, quiet and ready to run with a simple squeeze of a trigger. Best of all, these mowers produce zero exhaust emissions, making it an environmentally responsible way to take control of your environment. This entry was posted in Commercial Lawn Equipment, lawn care, Lawn Mowers, Outdoor Power Equipment, STIHL Outdoor Power Equipment and tagged STIHL Dealer, STIHL Dealer Delaware, STIHL deals, STIHL Father's Day Deals, stihl outdoor power equipment, STIHL products, Suburban Lawn Equipment on June 7, 2018 by Suburban.